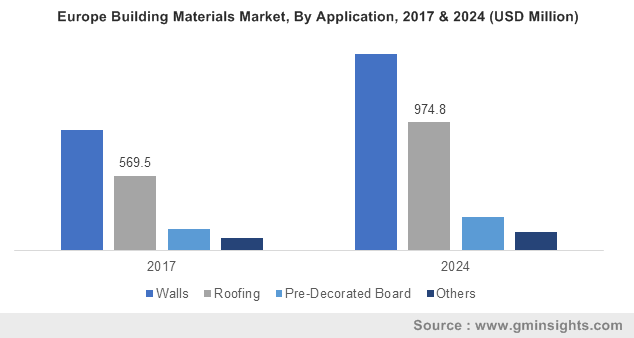 The Europe building materials market has lately been growing at a significant pace, characterized by an increase in government expenditure on infrastructure development along with a surge in the demand for affordable houses. Rise in migrant population coupled with rapid urbanization are leading to the construction of new residential structures, which in turn will drive the growth of this industry in the upcoming years. An upsurge in the inclination towards renovation & remodeling, premium interiors, in addition to the rise in disposable incomes are estimated to augment the Europe building materials market. The rapidly growing population across several nations in Europe has also raised the demand for renovation projects and the development of existing buildings. A surge in consumer inclination toward modernized applications like laundry rooms, modular kitchens, and vanity will also be another factor positively impacting the growth of market. BASF Performance Materials is touted to be among the most popular companies in the Europe building materials market. Recently, the company has introduced an innovative insulation material for existing buildings. Having the thermal conductivity rated value of 0,035 W/(m*K), the insulation effect of the material is comparable to EPS and mineral wool. Thus the properties of Cavipor make it extremely suitable for energy renovation in the buildings constructed from double-wall masonry. Construction of this type is common in Northern Europe, which will further propel the market growth. The strong portfolio of products and services from BASF’s division of performance materials, coupled with a deep understanding of application-oriented system solutions, have not only strengthened the firm’s stance in the market but have also proved that the company is indeed committed to this industry through its close collaboration with customers and a clear focus on solutions. A couple months earlier, Independent builders merchant, James Burrell, had announced that the company is developing a new branch in Rotherham, Yorkshire. The new site, worth £2 million, will be the tenth for the company and is anticipated to open in the spring of 2019. This Rotherham-based branch will be featuring a 264 square meter trade counter and office area, onsite vehicles and a warehouse, and displays. Alike the existing branches of James Burrell’s branches at York and Ossett, this facility will provide a full range of roofing, timber, drainage, civils, insulation and heavy side building materials. With such moves undertaken by prominent industry players, it is overt that the Europe building materials market growth will depict a major incline in the years to come. The England based building materials supplier, Siniat, had rolled out a next generation external sheathing board nearly a couple of years back in a bid to assist projects in fending off the elements and speed up the site delivery process. The new product was designed and tested at the Avignon, France located Innovation and Technology Centre of Siniat’s divisional parent firm, Etex Building Performance. This product from Siniat would assist in weather-proofing a building quickly during the construction phase, which would allow interior trades to complete the work quicker as well as boost productivity on site. Analyzing the aforementioned instances, it is rather overt that the laudable efforts undertaken by prominent industry players would push the Europe building materials market trends in the coming years. The competitive spectrum of this industry, apart from these contenders, consists of notable companies like Bituline Industries S.A., Saint Gobain, Murdock Builders Merchants, PCI Augsburg, Puumerkki, UPM Plywood, Danzer, Fassa Srl, Gyproc Iberica and Kastamonu.